Endemic to South Korea where it is found in the Provinces of: Jeju Island (Mt Halla); Joelanum (Deok-yu-san (Mt Togyu (Deojyu)); Joellabak (Mt. Chiri (Jiri); Gyeongsangnam (Mt Gaya). The area of occupancy has been calculated to be ca 12km² (Kim et al., 2000). 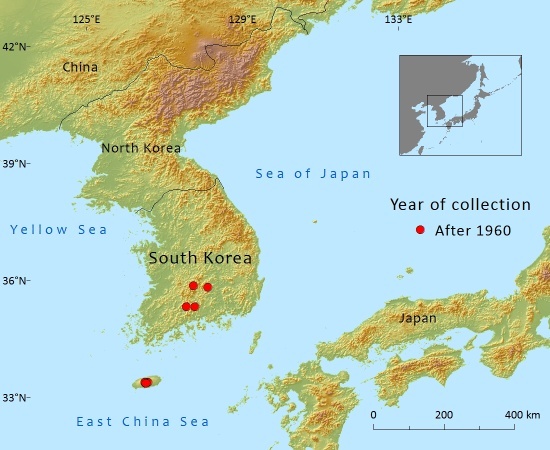 The subpopulation on Mt Halla (Jeju Island) is today a remnant of a once much greater distribution, much of which was destroyed ca 100 years ago. Occurs in sub-alpine areas on shallow mountain soils poor in humus content. Its elevational range is between 1000m and 1900m above sea-level. The climate is cool temperate, with a summer monsoon bringing the annual precipitation above 1600mm. Abies koreana grows in pure stands or mixed with Betula ermanii, Taxus cuspidata, Prunus maximowiczii, P. sargentii, Cornus kousa with an understory of Sasa quelpartensis on Cheju Island. On the mainland it is also mixed with Picea jezoensis, Pinus koraiensis, P. densiflora, Taxus cuspidata, Quercus mongolica var. mandshurica, Cornus controversa, Acer spp. Fraxinus sieboldiana, Magnolia sieboldii, Sorbus commixta, and several genera of low shrubs, e.g. Juniperus, Deutzia, Ribes and Rhododendron. The forest is usually open and essentially dominated by conifers, with A. koreana a minor component. The Korean Fir has an estimated area of occupancy (AOO) of about 12km². It occurs in four fragmented locations; Mt. Gaya, Mt. Chiri and Mt. Togyu on the mainland and Mt. Halla on the remote Jeju Island. The distances between each location range from 40–250 km and are likely to be too great to allow for effective gene flow. There is clear and documented evidence of a continuing decline in the AOO and quality of habitat due to a number of factors which include the effects of climate change, pathogen attack and on Mt. Halla the invasion of pines and bamboo (Sasa). For these reasons A. koreana has been assessed as Endangered. The conservation status of this species needs to be carefully monitored as if there is a further reduction of the current AOO of 12km² to 10km² or below, then it will qualify as Critically Endangered. Abies koreana is facing critical population declines (Kim et al., 1998). Regional decline was first recognized in the 1980s (Woo, 2009). The continuing decline in the AOO is a result of trees suffering from die-back and eventual death and is likely to be the result of climate change. For example, on Mt Togyu the rate of dead trees sampled was 18.18% (Kim & Choo, 2000) while on Mt Halla it amounts to 6.44% (Kim et al., 2007). It is thought that the dieback is most probably the results of complex interactions between multiple environmental factors caused by global warming (Woo, 2009). Abies koreana is also in decline due to vigorous competition from the bamboo Sasa quelpaertensis and invading pine trees on Mt Halla (C.-S. Kim pers. obs.). Studies suggest that damage by the fungal pathogen Racodium therryanum may be a significant inhibitory factor for the natural regeneration of A. koreana on Mt Halla (Cho et al., 2005, 2007). Twenty years ago between 30%–40% of the subpopulation in Deok-yu (10% of the National Park) was destroyed during the development of a ski resort. It is afforded protection in all its locations, however even with protection 10% of the Togyu (Deok-yu) National Park was destroyed during the development of a ski resort. To reverse the decline of this species and preserve the genetic diversity, it is necessary to increase natural regeneration from seeds; for this to happen there needs to be an understanding of the factors that affect seed germination and initial seedling survival (Cho, 2007). More research is needed into the effects of global warming; temperature and water relation seem to be of great significance in Korean Fir dieback, but little is known about this relationship and the direct effects on A. koreana (Woo, 2009). Cho, H.K., Miyamoto, T., Takahashi, K., Kim, D.S., Hong, S.G. & Kim, J.J. (2005). First report on Racodium therryanum associated with seed infection of Abies koreana in Korea. Journal of Plant Pathology 21(3): 297–300. Cho, H., Miyamoto, T., Takahashi, K., Hong, S. & Kim, J. (2007). Damage to Abies koreana seeds by soil-borne fungi on Mount Halla, Korea. Canadian Journal of Forest Research 367(2): 371–382. Kim, G.T. & Choo, G.C. (2000). Comparison of growth condition of Abies koreana Wilson by districts. Korean Journal of Environmental Ecology 14: 80–87. Kim, G.T., Choo, G.C. & Baek, G.J. (1998). Studies on the structure of forest community in subalpine zone of Mt. Halla Abies koreana forest. [In Korean with English summary]. Journal of Korean Forestry Society 87: 366–371. Kim, G.T., Choo, G.C. & Um, T.W. (1997). Studies on the structure of Abies koreana Community at Subalpine Zone in Hallasan. Korean Journal of Environmental Ecology 21(2): 161–167. Kim, S.D. & Yoon, W.S. (1991). Regeneration process of Abies koreana forest in Banya, Mt Jiri. Research Reports of Environmental Science Technology Chungnam National University 9: 97–106. 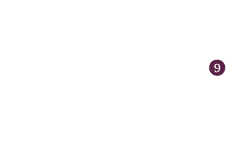 Kim, Y.-S., Chang, C.-S., Kim, C.-S. & Gardner, M. (2011). 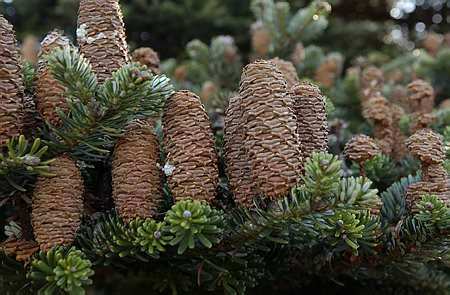 Abies koreana. In: IUCN 2012. IUCN Red List of Threatened Species. Version 2012.2. . Downloaded on 11 November 2012. Lee, C.S. & Cho, H.J. (1993). Structure and dynamics of Abies koreana Wilson community in Mt Gaya. Korean Journal of Ecology 16(1): 75–91. Lee, Y.W. & Hong, S.C. (1995). Ecological studies on the vegetational characteristics of the Abies koreana forest. Journal of the Korean Forestry Society [In Korean with English summary.] 84: 247–257. Oh, K.K., Jee,Y. & Park, S.G. (2000). Dynamic patterns of Abies koreana population in Chirisan National Park: central of east area in Chirisan National Park. Korean Journal of Environmental Ecology 13(4): 330–339. Woo, S.Y. (2009). Forest decline of the world: A linkage with air pollution and global warming. African Journal of Biotechnology 8(25): 7409–7414. Woo, S.Y., Lim, J.W. & Lee, D.K. (2008). Effects of temperature on photosynthetic rates in Korean Fir (Abies koreana) between healthy and dieback population. Journal of Integrative Plant Biology 50(2): 129–152. Y.-S.Kim,C-S.Chang,C.-S.Kim,and M.F.Gardner, 2016. Abies koreana, from the website, Threatened Conifers of The World (http://threatenedconifers.rbge.org.uk/taxa/details/937).